This strip brings up a few questions. First, why would you wrap up the tree the partridge was living in, either trapping him inside and suffocating him or effectively kicking him out of his house? Second, will Bagby be getting all the gifts on the list from the 12 Days of Christmas song? If so, wouldn't it be weird on day 8 when he gives 8 maids a-milking to a milkmaid? Or is the idea to give her some other maids to do her work for her? Though I guess the key to comedy is to not overthink it. 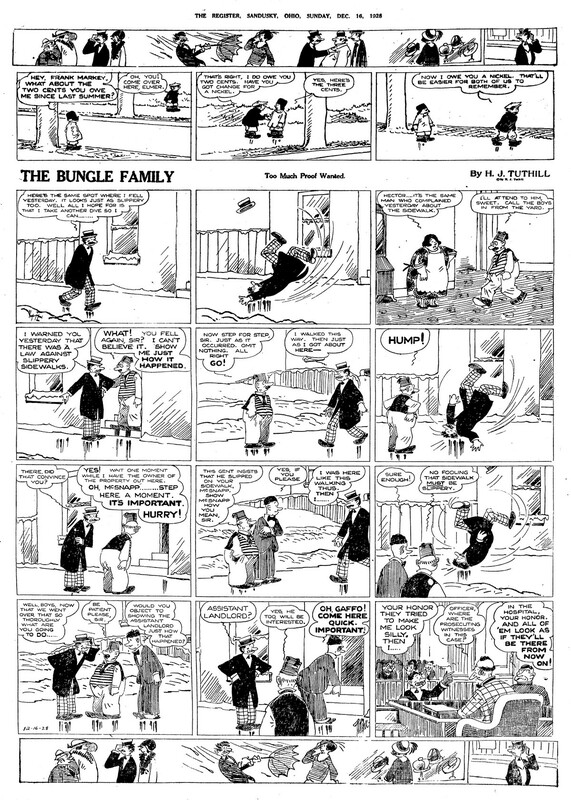 The Bungle Family was created in 1918 by Harry Tuthill, and it's nearly impossible for me to separate it in my mind from The Nebbs, The Gumps, and The Dingbat Family, because they're all so similar in many ways, and as I stated a few days ago, are in some cases direct rip-offs of each other. Still, they're each enjoyable in their own way. This one isn't necessarily Christmas related, but it does illustrate one of the perils of winter weather. While all of those who end up as "prosecuting witnesses" in this strip also end up in the hospital, it's a wonder that George Bungle doesn't as well. 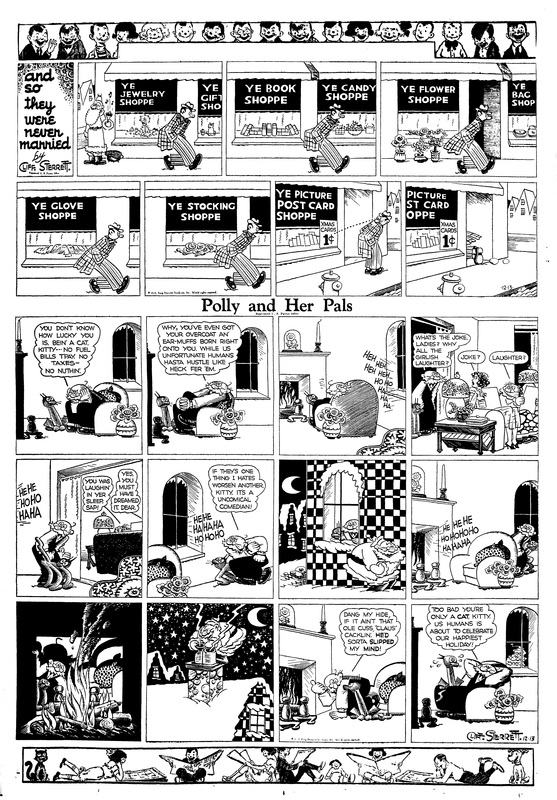 He falls over three times in this strip alone, and who knows how many more times after the scene shifts. He must have a quite a hard head, in more ways than one. This is a very early Thimble Theater, nearly 10 years before Popeye would appear. 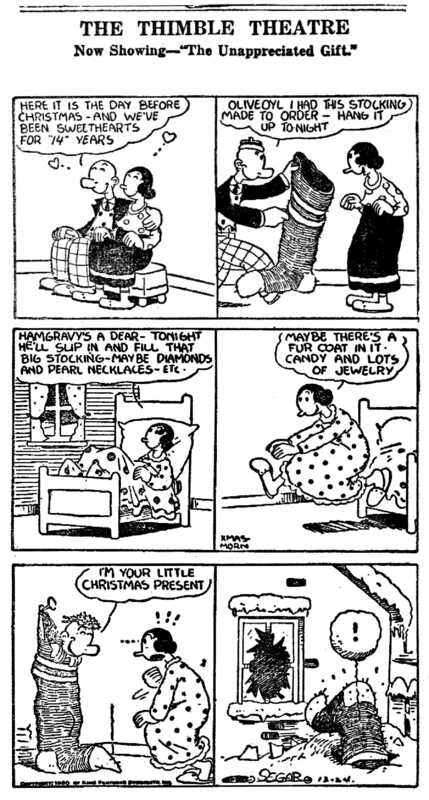 At this time Olive Oyl was in love with Harold Hamgravy, who we see here coming up with a romantic idea that falls flat. After Popeye appeared in 1929, he was so popular that he replaced Hamgravy completely. I'd guess it's because he didn't pull stunts like this. Napoleon, like other comic strip dogs over the years, can be a bit bumbling and stupid, but as we see here, he still has a heart of gold. I think I'd rather get gifts brought to me by a dog dressed as Santa Claus than a grumpy old man anyway. 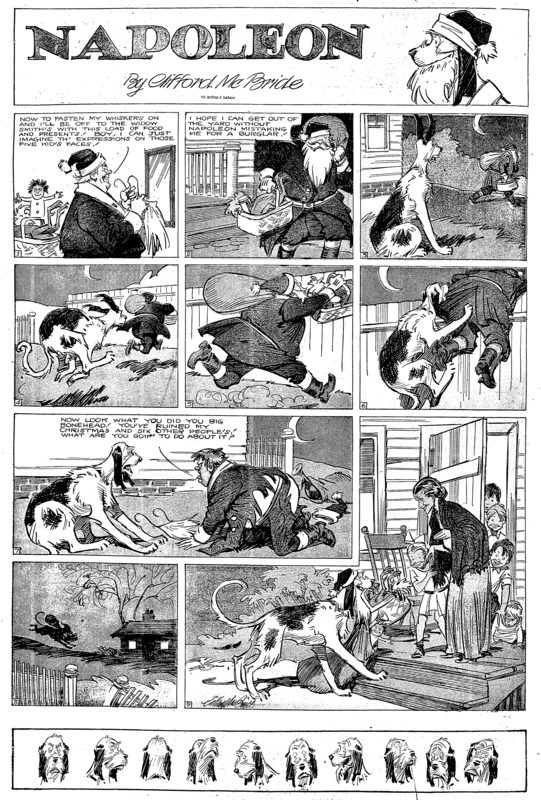 I love Clifford McBride's loose but realistic style. I enjoy the artwork so much, the dialogue is almost not needed in this strip at all. In fact, if I was the editor, I might just tell him to remove it entirely. The images tell the story completely. Here we have one of my favorite unknown cartoonists, Cliff Sterrett, with Polly and Her Pals, complete with a topper, which I actually like more than the strip itself. Unfortunately, Polly only appears in one panel, but we do get the ridiculously legged cat in quite a few of them. Sterret's cartoons are more fun to look at than to read, in my opinion, but the gag in this one isn't too horrible.